The harvest season lasts from mid-June to the first week of October. On your selected delivery day, visit your drop site between the hours of 5:00 and 9:00 pm. Here you will find a box marked with your name on a clothes pin attached to the box. Remove the clothes pin and attach it next to your name on the announcement board. Take the box home with you, empty it and bring it back the next week. 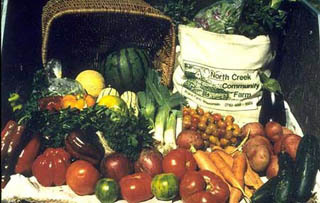 A full share, with 15-35 pounds of produce picked fresh from the fields, is enough to feed a typical family of four. 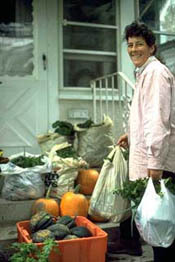 A variety of vegetables are delivered each week. Shares will be delivered weekly for approximately 15 to 18 weeks, depending on the length of the growing season and the share type. In addition to delicious fresh vegetables and herbs, you will also receive decorative flowers, a weekly newsletter (sample) with updates and recipes, and announcements of farm festivals. New this year, shares are available for purchase on a sliding scale. This is both to keep me farming and to allow people with different income levels to have a membership in the farm. Please pay what makes sense for your family. A deposit of at least $150 is due when you sign up, and final payments are due August 1, 2016. You must choose a drop site from the list below and include it in your membership form.